No bid visits: will 'Agenda 2020' yield real change? The International Olympic Committee tends, generally speaking, to move with tradition and with careful adherence to process in mind. Thus perhaps, maybe, possibly the final outcome of the all-members session in December in Monaco, at which the IOC will review President Thomas Bach’s “Agenda 2020” review and potential reform plan, will produce far-reaching change. But the signal sent at the close of Thursday’s policy-making executive board meeting seems decidedly otherwise. In announcing that the ban on IOC member visits to bid cities will remain locked into place, Bach shot down what could have been one of the most welcome changes to IOC practice, a move that could have ushered in an era of fresh transparency and governance. Instead, even as he sketched out for reporters on a teleconference some of the highlights of the “Agenda 2020” recommendations — saying he wants the bidding procedure to be more of an “invitation” to cities than an “application for tender” and wants proposals for a more flexible sports program — the concern reasonably has to be that change will end up, in practice, being incremental or at the margins, not the sort of shake-up that quite clearly is in order. The challenge, as is evident to everyone familiar with the Olympic movement, is that it needs to figure out the 21st century. When, as a for instance, you only have two cities in the entire world — Beijing and Almaty, Kazakhstan — that want in on one of your flagship opportunities, the 2022 Winter Games, and when, moreover, you, the IOC, have $880 million to give away to a winning city’s organizing committee and still there are only two entries in the derby, something systemic is not right. On a different level, the IOC needs a crash course in how today’s teens and 20-somethings talk and think so it can then speak to these young people, wherever in the world they are, in the language of their hopes and dreams. Full details of the set of 40 Agenda 2020 recommendations — or as the IOC press release slyly put it, “20 + 20” (get it?) — were not released Thursday; they need to circulate yet to the IOC members; all 40 are due to be made public in November. One significant change was disclosed: the introduction of an Olympic TV channel. This is, for the Olympic movement, big stuff. The IOC works best when the president is large and in charge. Unquestionably, this is Bach’s IOC. That executive board meeting was supposed to run three days. They got through everything in two — less, actually, because the closing teleconference was at 2:30 in the afternoon central European time. This is indicative of a president who had his priorities for the meeting detailed and his board, well, on board. Ladies and gentlemen — nothing wrong with any of that. Thanks now for the good work, and go home. See you in Monaco in December for the discussion and the voting, everyone. Presumably, by the way, the votes will be more or less worked out ahead of time. There will be a lot of phone calls between now and then. This is the way the IOC functions most smoothly. There's nothing undue or nefarious or even just weird about it. It took Bach’s predecessor, Jacques Rogge, years to figure this out. Rogge experimented with enhanced democracy within the IOC and — it was a mess. Elected in 2001, it perhaps wasn’t until after the 2004 Athens Olympics, maybe even a couple years later, that Rogge made it clear that, OK, I’m the boss. Bach — this analysis is absolutely intended to be complimentary — came to office last September and, in a myriad of ways, in particular the robust manner he has sought to delineate sport’s role in a political world, wasted zero time making it plain he is running the show. There have always been two ways to view Agenda 2020, the blueprint of which was right there in Bach’s campaign manifesto. Or you could argue that Agenda 2020 gave Bach a year to get buy-in from most (no one ever gets all) of the stakeholders throughout the Olympic movement, and beyond. If you see it this latter way — pretty darn clever, right? It’s pretty darn clever because Bach is himself a most shrewd guy and, as well, learned a great deal from many people, including Rogge and, before that, Juan Antonio Samaranch. The overarching question throughout Agenda 2020 has been how far Bach can — could? is willing to? — push the IOC. This is where the bid visits issue is so telling. The visits were banned as a response to the scandal that erupted in late 1998 amid Salt Lake City’s winning bid for the 2002 Winter Games. Ten IOC members resigned or were expelled for taking cash, gifts or other inducements. In recent years, some have pushed to reinstate the visits. For instance, would the IOC really have voted for Sochi if the members had been able to go there and seen — what? Virtually nothing was there in 2007. Could the IOC have saved itself a (purported) $51 billion headache if there had been visits? Further, the real issue is one of trust — revolving around the members themselves. If you take a step back, there are two parties in the bid game, the cities and the members. The IOC long ago purged itself of those members it couldn’t trust. Remember, the cities are the ones seeking favor — they’re the ones with the gifts and inducements most readily at hand. So, now, who needs to be curbed, the cities or the members? To that end, Bach faces a credibility gap when he flies around the world and talks to anyone — you name it, anyone from prime ministers to civic groups — about the IOC itself. Is he supposed to be taken as seriously as he could be, as he should be, when his own members can’t be trusted to visit the cities bidding for his franchise? This is why a debate in Monaco about bid visits could have been one signaling a renewed era of IOC transparency. Change is what the IOC needs. How much it’s going to get is what remains to be seen. Friendship, excellence and respect — these are the key values underpinning the mission of the International Olympic Committee, indeed the Olympic enterprise worldwide. Moreover, the IOC likes to say that athletes are at the center of everything everyone in the Olympic movement does. Two episodes over the weekend raise serious questions about whether both are true, or just so much lip service. And with the IOC’s policy-making executive board meeting later this week in Switzerland, the issue becomes what — if anything — the IOC is going to do about it. Shamil Tarpischev, the head of the Russian tennis federation and an IOC member since 1994, got caught saying on a talk show that sisters Serena and Venus Williams were “brothers” and and “scary” to look at. He denied any “malicious intent,” according to Associated Press and said his quotes had been taken out of context. “The IOC will directly contact Mr. Tarpischev to ask him for a full explanation of his comments,” a spokesman said Monday in response to a request for comment. Many runners at Sunday’s Beijing Marathon opted for particle-filtering surgical masks to cope with the oppressive smog blanketing the city. The smog was so bad the U.S. Embassy rated the air quality hazardous. Even the People’s Daily China acknowledged conditions were bad. To be clear, the IOC itself had nothing to do with the Beijing Marathon. But — Beijing and Almaty, Kazakhstan, are the only two cities in the world that are left in the race for the 2022 Winter Olympics. Beijing, where the air is so bad — and this, six years after the 2008 Summer Games, amid promises then by the Chinese authorities that it was going to get better, instead of worse — that runners are wearing surgical masks to try to get through the running of a marathon? Or Almaty, where remarks last week from the director of the ice rink in Astana proved unusually revealing. The Asian Winter Games in Kazakhstan in 2011 split time between Astana and Almaty; the 2022 plan, at least for now, is to focus solely on Almaty. “We have to formulate our bid something like this: ‘The Olympic Games in Almaty — the cheapest, thriftiest, smartest Games,” said rink director Nail Nurov. He went on to say, referring to the $51 billion figure associated with the 2014 Games, “What the Russians have done in Sochi is a serious problem,” because by spending so much, “they raised the bar to “unbelievable organizational heights.” The perceived “rule” that each edition of the Games must better the preceding one was, he said, probably why Oslo, Munich, Krakow, St. Moritz/Davos, Stockholm and Lviv had said no thanks to 2022. Oh, and in 2013 voters in Austria said no to a 2028 Summer Games bid as well. If you were writing a slogan, and at the risk of being perhaps overly glib, what would you have? To use an American saying: this is no way to run a railroad. Three times in recent weeks, after Oslo dropped out, reducing the number of purportedly viable candidates from three to two, this space has urged the IOC to consider whether the 2022 campaign as it stands now is best practices, and to put the whole thing on pause for six months. The IOC has said it is committed to its process. In ordinary times, that would be a defensible position. As this space has pointed out, however, this is an extraordinary situation, and extraordinary times call for an extraordinary re-think — and leadership. Lest all this be seen as the promotion of a 2022 late-stage bid by the U.S. Olympic Committee from Denver and Salt Lake City — there is no signal that is in the works. The USOC is intent on 2024, if that still seems do-able after the IOC’s all-members vote on President Thomas Bach’s “Agenda 2020” review and potential reform plan in December. What has to be asked, however, is why other cities aren’t even being given a chance to see if they might be interested. Is the IOC quietly doing due diligence? Shouldn’t it be? To reiterate: the IOC has $880 million to give to the winning city, which would cover nearly half, if not more, of a prudent organizing committee’s operating costs. When Oslo dropped out, the IOC said it intended “to communicate, to communicate, to communicate” about the advantages of bidding for the Games. It has been nearly three weeks now. There has been no such communication. There has been an announcement that the IOC intends to meet with sports officials in Norway about what went wrong there. Why meet with sports officials? If you want a debrief, fine. But in this context, what authority do such sports officials have? It was the government that pulled the plug. The politicians are the ones paying the bills. If you want to do something constructive, meet with the politicians, as awkward, weird, uncomfortable, whatever it might be. Remember: the Lillehammer Youth Games are in 2016. Who’s paying for those? As Bach said in September in South Korea at the Asian Games — and it is a profound mystery why more people have not picked up on this huge statement — sports and politics absolutely do mix. Which leads, in its way, back to Tarpischev. Tarpischev is close to Russian president Vladimir Putin. When Bach was elected IOC president, the very first call he — that is, Bach — took was from Putin. So whatever is going to happen is going to be complex and layered. Tarpischev, 66, has already been fined the maximum $25,000 and banned from the WTA Tour for a year. According to RT.com, Tarpischev appeared Oct. 7 on a show called “Evening Urgant” — the host’s name is Ivan Urgant — with former WTA player Elena Dementieva. “I was at the Olympics and saw Maria Sharapova play her … him …," Urgant said. “… One of the Williams brothers,” Tarpischev finished. Can there be little question that his remarks were not only insensitive but also sexist and racist? Friendship, excellence and respect is a long way away from vodka, balalaika and bears. 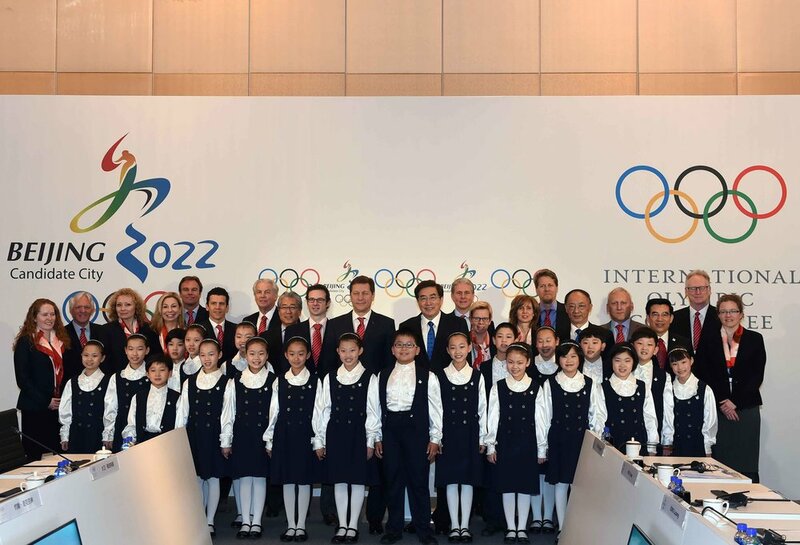 Tolerance and making the world even just a little bit better — this is what the International Olympic Committee, indeed the entire Olympic movement, piece by piece, day by day, person by person, is (supposed to be) about. Whether or not Tarpischev intended to hurt anyone is not entirely relevant. In this case, the person whose feelings are at issue is Serena Williams. She is a big person and doesn’t need anyone to defend her in this sort of context but, honestly — four Olympic gold medals, three in doubles with her sister, and then of course the thrilling singles victory at Wimbledon in 2012? Remember, the athletes are at the center of everything, right? Tarpischev, whether he or Putin like it or not, has to be held to a higher standard. Too often the IOC is criticized for reaching for a utopia of sorts in which sport can not make a difference in showing the world how to get along. This incident offers a teachable moment. To begin, the International Tennis Federation has been deadly silent on this issue. That is indefensible. The WTA has taken strong action. So should the ITF. European soccer has been marked by ugly incidents of racism. Here is the perfect example for the IOC to demonstrate that words, even if meant in jest, which these arguably were not, can be just as hurtful as, say, throwing a banana on a soccer pitch. In a world in which racism and sexism are regrettably yet virulent, the IOC can, and should, provisionally suspend Tarpischev. You want the legal hook? He has brought the IOC into disrepute with his remarks. The IOC ethics commission can take it from there. You want common sense? Everyone knows that hurtful words are the trigger for more. And that saying something was just a joke is often just a lame way of covering up. Again, extraordinary times call for extraordinary leadership. If the IOC means what it says, then there has to be more than just lip service.